Is the iPhone an even bigger success than the iPod? The iPod, once Apple’s biggest source of income, has been overtaken by the iPhone in terms of the money it’s bringing in to the company. This is a pretty significant development, so let’s have a closer look at this trend. Judging by this graph, it looks like mid-2008 might have been the turning point for the iPhone, i.e. when Apple launched the iPhone 3G. 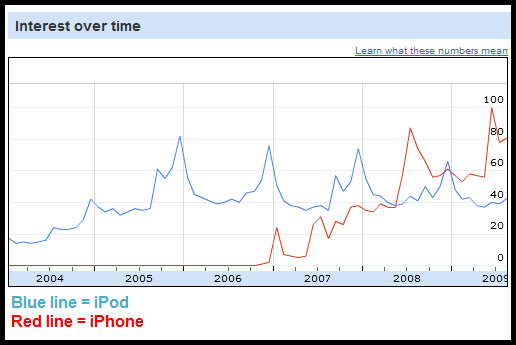 From then on the iPhone has remained more popular than the iPod, at least in terms of what people are searching for online. Of course, these are not sales numbers, but the trend shown is definitely relevant. Another notable thing with this graph is that the high point for the iPhone is higher than it ever was for the iPod (at least since 2004, Google’s trend data doesn’t go further back than that). Does this mean that Apple has an even bigger success on its hands with the iPhone than it ever had with the iPod? understandable,since iPhone has a iPod.